If your sharpening supplies are scattered all over your shop, here's a project designed to keep them in one place. 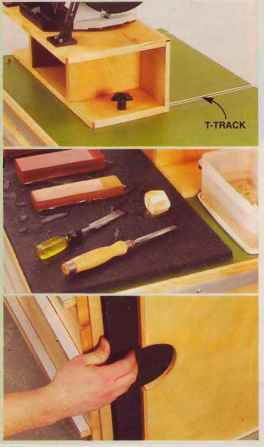 This station holds everything you need for grinding, tapping and honing, with room to spare for storing tools. Picture this: you're grinding at the perfect height for precision work. When you're done, you push the grinder back out of the way and vacuum or wipe off grinding dust from the cabinet's plastic laminate surface. You pull a rubber mat from its storage pocket, retrieve your stones from one of the drawers, and you're ready to hone. That mat is really terrific. It's made from flexible bill firm solid rubber. Water can't soak in; it just makes puddles. Better yet, stones stay put, as if they were locked in place. This project is designed for a 5'6" to 5'10" tall woodworker. If you're shorter or taller than this, you may want to alter the plans so the working surfaces arc at more comfortable heights. Experiment before you build. First, figure out the height at which you're comfortable honing (don't forget to add the thickness of the rubber mat and stones). For most folks, this is roughly equal to the height of their wrists when their arms are hanging at their sides. Use this measurement to determine height of the cabinet. Second, figure out the height at which you're comfortable grinding. 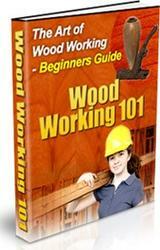 Man)' woodworkers prefer elevating a grinder so its tool rests are about elbow-high. This height will vary between 6-in. and 8-in. grinders (we used an 8-in. grinder for our station). Use this measurement to determine the height of the shelf above the cabinet. Use basic plywood-construction techniques to build the base cabinet and drawers. The cabinet is very similar to our Tool Chest in AW#96, October 2002, page 60. You'll find complete step-by-step instructions and many how-to photos in that article. 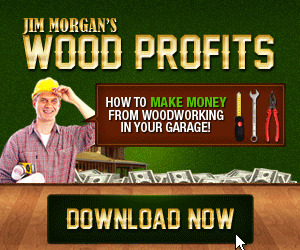 You can also view or download this story at our web site, www.americanwoodwork-er.com/toolcabinet. See Fig. C for the location of the dadoes and rabbets in the cabinet's sides and Fig. B for drawer details. To ensure a flat top, use MDF for the substrate (Bl, Fig. A). Edgeband it with solid birch (B2 and B3), mitered at the front corners. Use an 80-grit sanding block, a plane, or a router and flush-trim bit to level the edging (Photo 1). 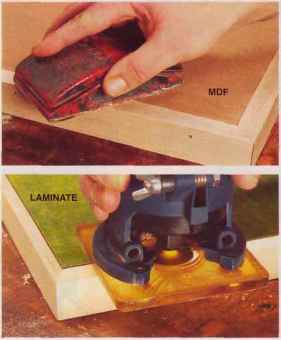 Apply the laminate (B4). Use a chamfer bit to trim the laminate and create the finished edge in one step (Photo 2). Rout two grooves for the T-track (B5 and Fig. D). Seal the grooves with slow curing epoxy to keep water from soaking into the MDF. While the epoxy is still tacky, apply a second, thicker coat and glue in the T-track (Photo 3). Drill two holes in the top for registration pins. These keep the rubber mat from sliding back and forth. Attach the top to the cabinet. Position it (lush with the back and offset on the right side, to allow for the pocket. The grinder sits on a tall shelf that slides on twoT-tracks. Pull the shelf forward for grinding; push it back to make room for sharpening. Place your water-stones on this solid rubber mat.They'll stay put on its non-skid surface. Slide the mat into this side pocket to protect it from grinding dust, which you don't want on your stones. • j The station's top is designed to survive water, grit, oil and shop dings. Begin building the top by gluing thick, solid edging to an MDF substrate. Level the edging with coarse sandpaper, then glue on an oversized piece of plastic laminate. 2Trim the laminate flush to the edging by routing a large chamfer.